Training begins in the gym but daily choices impact results. Choose wisely. Sleep, diet and rest days with a side of supplements equals gains. Greens is a given. No matter how clean you eat, cells can always benefit from nutrients. A scoop a day just might keep the Doctor away. Gym goals may differ but whether you are looking to build lean mass, lose body fat or maintain health, all muscle is made up of small building blocks called amino acids. Amino acids fall into 3 categories. They are conditionally essential, non-essential and essential. Human body is capable of making certain amino acids, however essential amino acids (EAA’s) CAN’T be manufactured in the body. They must be obtained in the diet. This is not always easy. 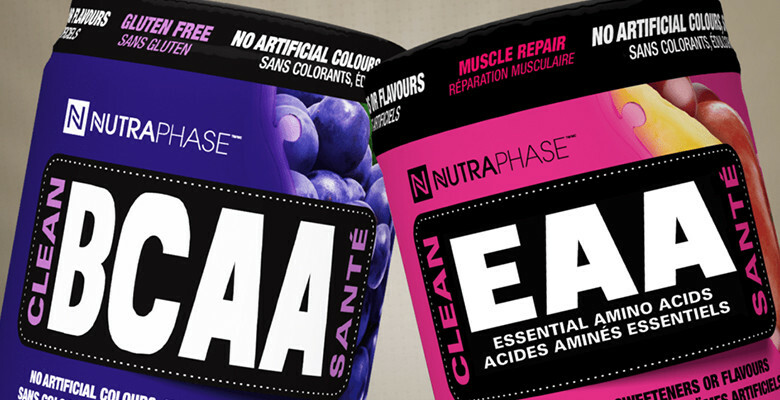 NUTRAPHASE offers high quality clean and fabulously flavored BCAA’s and EAA’s! WHICH one do you need? Well, BOTH! EAA’s are a combination of many amino acids working in synergy. All 9 essential amino acids used by NUTRAPHASE increase endurance, allowing you to trainer harder and longer. They help reduce soreness, making it easier to get back to the gym. Essential amino acids also help increase protein uptake which is key. Protein builds muscle! EAA’s contain the 3 BCC’s BUT look at the extras found in EAA’s. Lysine is a highly recognizable name to those who suffer from cold sores. Besides helping control the herpes virus, it also aids in calcium absorption. Histidine helps form and repair tissue as well as boost red blood cells with oxygen. Oxygen increases energy! Methionine works hard breaking down fats as well as having anti-oxidant properties. Detox detox and more detox! Without toxins clogging up the lymphatic system, hello energy! Phenylalanine is an important amino connected to moods. It also helps suppress hunger and even lessen pain in the body. Phenylalnanine converts to another amino acid, tyrosine using iron. Anyone suffering from an iron deficiency will benefit from this superstar amino. Low iron with a lack of Phenylalanine, may meantyrosine is low, potentially leading to compromised thyroid function. Our metabolism rate or rate at which we use calories for energy is directly linked to optimal functioning thyroid. I can’t forget beta alanine as it helps buffer the build up of lactic acid in active muscle. Just say, ” NO DOMS for me!”. Delayed onset muscle soreness (DOMS) means more time to train. BCAA’s are comprised of three branched chain amino acids called leucine, isoleucine and valine. They are readily available in foods BUT the highest concentration is in animal foods. They can be obtained in a plant based diet but meal combining becomes key. In the plant kingdom, only hemp and quinoa are complete proteins. Using NUTRAPHASE eliminates meal plan confusion while filling in the amino acid gaps! BCAA’s like EAA’s increase energy and performance. Preventing protein loss helps build muscle. 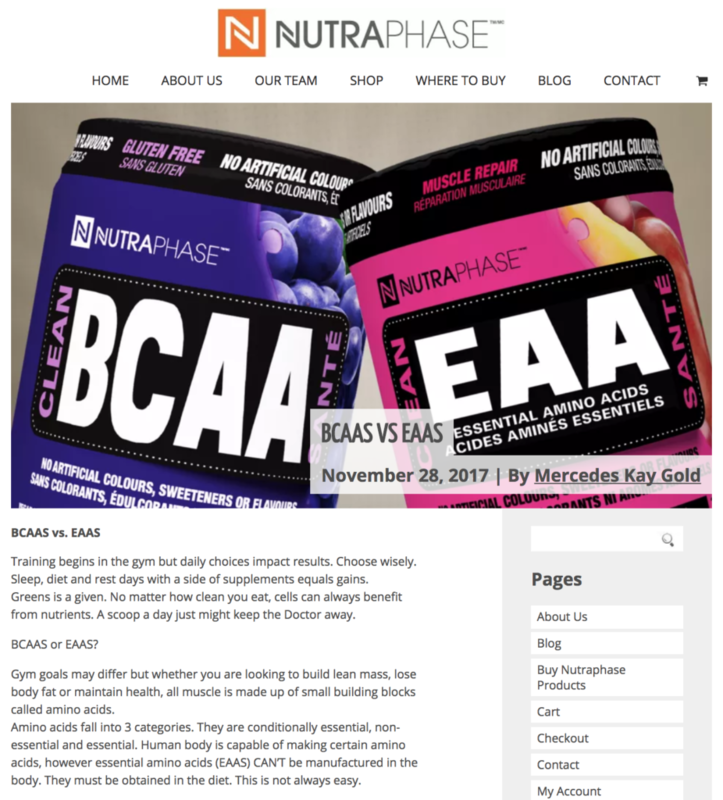 NUTRAPHASE BCAA’s contain 4 MONSTER reasons why they should be used in conjunction with EAA’s. 1) Glutamine helps counter cortisol. Cortisol is a hormone released under stress. It’s held responsible for stubborn belly fat! Glutamine is also a go-to in my practice, helping heal leaky gut holistically. 2) Citrulline malate changes into another amino acid arginine. It’s known for aiding the body to make more protein. It also helps dilate arteries and veins, allowing more oxygen rich blood to flow throughout the body. 3) B6 is beyond beneficial. It serves many roles. From converting food to energy, mood booster, helping metabolize fats and even migraine prevention….I love Vitamin B6. Did I mention it helps produce melatonin? I could go on and on. 4) Electrolytes aid in nerve function and help muscles contract. Electrolytes are essential for maintaining water balance. No one loves being bloated!